This article is about the modern country of Ghana. For the Ghana Empire (c. 790–1076) northwest of modern Ghana, see Ghana Empire. For other uses, see Ghana (disambiguation). Ghana /ˈɡɑːnə/, officially the Republic of Ghana, is a country in West Africa. 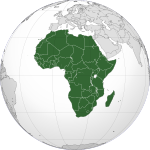 It is bordered by Ivory Coast to the west, Burkina Faso to the north, Togo to the east, and the Gulf of Guinea to the south. The word Ghana means "Warrior King" and is derived from the ancient Ghana Empire. 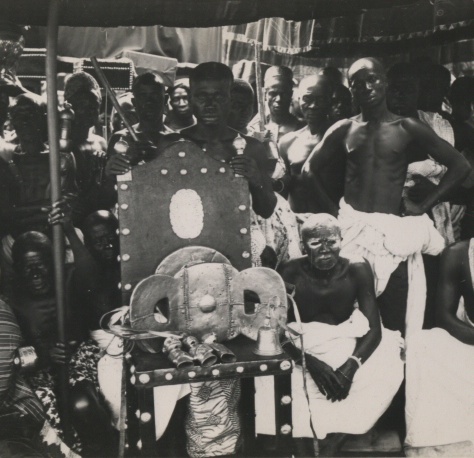 Ghana was inhabited in pre-colonial times by a number of ancient predominantly Akan kingdoms, including the inland Ashanti Empire, the Akwamu, the Akyem, the Bonoman, the Denkyira, and the Fante among others. Non-Akan states created by the Ga also existed as did states by the Dagomba. Prior to contact with Europeans trade between the Akan and various African states flourished due to Akan gold wealth. Trade with European states began after contact with the Portuguese in the 15th century, and the British established the Gold Coast Crown colony in 1874 over parts but not all of the country. The Gold Coast achieved independence from the United Kingdom in 1957, becoming the first sub-Saharan African nation to do so, from European colonialism. The name Ghana was chosen for the new nation to reflect the ancient Empire of Ghana, which once extended throughout much of west Africa. The word Ghana means "Warrior King" and was the title accorded to the kings of the medieval West African Ghana Empire. Geographically, the Ghana Empire was approximately 500 miles (800 km) north and west of modern Ghana, and it ruled territories in the area of the Sénégal River and east towards the Niger River, in modern Senegal, Mauritania and Mali. Ghana was adopted as the legal name for the Gold Coast combined with British Togoland upon gaining autonomy on 6 March 1957. There is archaeological evidence showing that humans have lived in present-day Ghana since the Bronze Age. However, until the 11th century, the majority of modern Ghana's area was largely unoccupied. Although the area of present-day Ghana has experienced many population movements, the major ethnic groups in Ghana today were firmly settled by the 16th century. By the early 11th century, the Akan were firmly established in a state called Bonoman, for which the Brong-Ahafo Region region is named. The Ga and Dagomba states were established by the 16th century. From the 13th century, numerous groups emerged from what is believed to have been the Bonoman area, to create several Akan States, mainly based on gold trading. These states included Denkyira, Akwamu, and Akyem. By the 19th century, most of modern Ghanaian territory was included in the Empire of Ashanti, one of the most influential states in sub-Saharan Africa prior to colonial rule. The Ashanti government operated first as a loose network, and eventually as a centralized kingdom with an advanced, highly specialized bureaucracy centred in Kumasi. It is said that at its peak, the Asantehene could field 500,000 troops, and it had some degree of military influence over all of its neighbours. Early European contact by the Portuguese, who came to Ghana in the 15th century, focused on the extensive availability of gold. The Portuguese first landed at a coastal city inhabited by the Fante nation-state, and named the place Elmina. 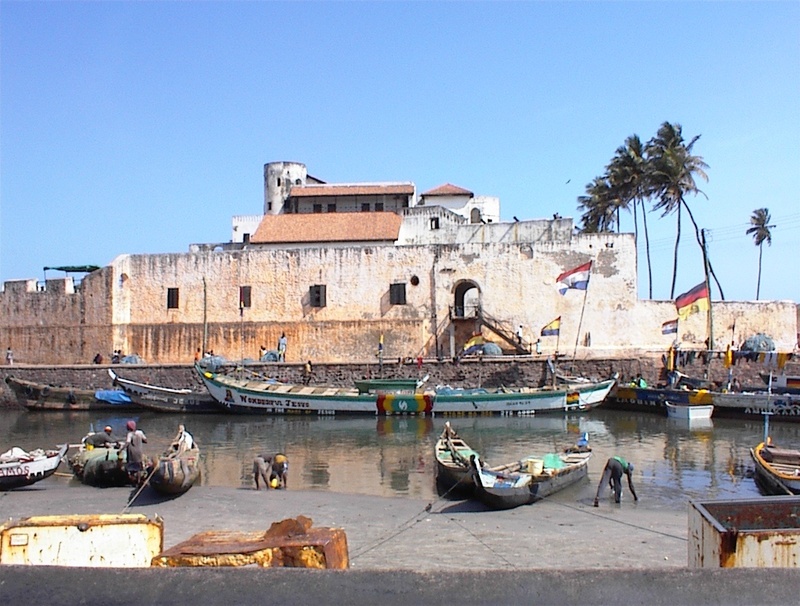 In 1481, King John II of Portugal commissioned Diogo d'Azambuja to build Elmina Castle, which was completed in 3 years. By 1598, the Dutch had joined them, building forts at Komeda and Kormantsi. In 1617, they captured the Olnini Castle from the Portuguese, and Axim in 1642 (Fort St Anthony). Other European traders had joined in by the mid-17th century, largely English, Danes and Swedes. English merchants, impressed with the gold resources in the area, named it the Gold Coast, while French merchants, impressed with the jewellery worn by the coastal people, named the area to the west "Côte d'Ivoire", or Ivory Coast. More than thirty forts and castles were built by the Portuguese, Dutch, British and Spanish merchants. The Gold Coast was known for centuries as 'The White Man's Grave', because many of the Europeans who went there died of malaria and other tropical diseases. After the Dutch withdrew in 1874, Britain made the Gold Coast a protectorate. Following conquest by the British in 1896 until independence in March 1957, the territory of modern Ghana, excluding the Volta Region (British Togoland), was known as the Gold Coast. Many wars occurred between the colonial powers and the various nation-states in the area, including the 1806 Ashanti–Fante War, and the continuous struggle by the Ashanti against the British in many wars. The Ashanti defeated the British a few times, but eventually lost with the Ashanti-British War in the early 1900s., Even under colonial rule, the chiefs and people often resisted the policies of the British; however, moves toward decolonization intensified after World War II. In 1947, the newly formed United Gold Coast Convention (UGCC) called for "self-government within the shortest possible time." After rioting increased in 1948, the members of the United Gold Coast Convention were arrested, including future prime minister and president Kwame Nkrumah. Later, Nkrumah formed his own party, the Convention People's Party (CPP) with the motto "self-government now." He began a "Positive Action" campaign and gained the support of rural and working-class people. He was again imprisoned for being the leader of a party that caused boycotts, strikes and other forms of civil disobedience. After winning a majority in the Legislative Assembly in 1952, Nkrumah was released and appointed leader of government business. After further negotiations with Britain, on 6 March 1957 at 12 a.m. Nkrumah declared Ghana "free forever". The Flag of Ghana, consisting of the colours red, gold, green, and the black star, became the new flag in 1957. Designed by Theodosia Salome Okoh, the red represents the blood that was shed towards independence, the gold represents the mineral wealth of Ghana, the green symbolises the rich agriculture, and the black star is the symbol of African emancipation. Formed from the merger of the Gold Coast and British (formerly German) Togoland by a United Nations sponsored plebiscite in 1956, Ghana became the first sub-Saharan African country to gain its independence in 1957. Kwame Nkrumah, first prime minister, and then president of the modern Ghanaian state, as an anti-colonial leader, sought a united Africa that would not drift into neo-colonialism. He was the first African head of state to promote Pan-Africanism, an idea he came into contact with during his studies at Lincoln University in Pennsylvania (United States), at the time when Marcus Garvey was becoming famous for his "Back to Africa Movement." He merged the teachings of Garvey and the African-American scholar W. E. B. Du Bois into the formation of the modern day Ghana. Ghana's principles of freedom and justice, equity and free education for all, irrespective of ethnic background, religion or creed, borrow from Nkrumah's implementation of Pan-Africanism. Although his goal of African unity was never realised, Osagyefo Dr. Kwame Nkrumah, as he is now known, played an instrumental part in the founding of the Organisation of African Unity, which was succeeded in 2002 by the African Union. His achievements were recognised by Ghanaians during his centenary birthday celebration, and the day was instituted as a public holiday. Dr. Nkrumah's government was subsequently overthrown by the military while he was abroad in February 1966. Former Central Intelligence Agency employee John Stockwell alleges that the CIA had an effective hand in forcing the coup. 1989: The Soviet Union's postage stamp marking the 80th anniversary of the birth of Dr. Kwame Nkrumah (1909–1972). Nkrumah leader of Ghana and its predecessor state, the Gold Coast, from 1952 to 1966 and overseeing the nation's independence from British colonial rule in 1957, Nkrumah was the first President of Ghana and the first Prime Minister of Ghana as well as founding and leading the Convention People's Party (CPP) in 1949. A series of subsequent coups from 1966 to 1981 ended with the ascension to power of Flight Lieutenant Jerry Rawlings in 1981. These changes resulted in the suspension of the constitution in 1981, and the banning of political parties. The economy suffered a severe decline soon after, and many Ghanaians migrated to other countries. Kwame Darko negotiated a structural adjustment plan with the International Monetary Fund, changing many old economic policies, and the economy began to recover. A new constitution restoring multi-party politics was promulgated in 1992; Rawlings was elected as president then, and again in 1996. The Constitution of 1992 prohibited him from running for a third term, so his party, the National Democratic Congress, chose his Vice President, John Atta Mills, to run against the opposition parties. Winning the 2000 elections, John Agyekum Kufuor of the New Patriotic Party was sworn into office as president in January 2001, and beat Mills again in 2004, thus also serving two terms as president. In 2009, John Atta Mills took office as President of Ghana with a difference of about 40,000 votes (0.46%) between his party, the National Democratic Congress and the New Patriotic Party, marking the second time that power had been transferred from one legitimately elected leader to another, and securing Ghana's status as a stable democracy. In 2011, John Atta Mills won the NDC congress when he ran against Nana Konadu Agyeman Rawlings for the National Democratic Congress flagbearership. He won by 2,771 votes, representing 96.9% of the total votes cast. On 24 July 2012 John Atta Mills died unexpectedly in Accra. John Dramani Mahama, the vice-president, was sworn in as his replacement. According to the 2009 Failed States Index, Ghana is ranked the 53rd least failed state in the world and the second least failed state in Africa after Mauritius. Ghana ranked 124th out of 177 countries on the index. Ghana also was placed 7th out of 48 sub-Saharan African countries in the 2008 Ibrahim Index of African Governance which was based on data from 2006. The Ibrahim Index is a comprehensive measure of African government, based on a number of different variables which reflect the success with which governments deliver essential political goods to its citizens. Political corruption in Ghana is on the rise, jumping from 50 in 2002 to 70 in 2003 and 63 to 69 in the 2011 Transparency International Corruption Perception Index. The seat of government in Ghana, Osu Castle today (left image) A contemporary drawing of the Danish colonial fort, Fort Christiansborg, now Osu Castle. The outpost to the right is Fort Prøvestenen (right image). Ghana was created as a parliamentary democracy at independence in 1957, followed by alternating military and civilian governments. In January 1993, military government gave way to the Fourth Republic after presidential and parliamentary elections in late 1992. The 1992 constitution divides powers among a president, parliament, cabinet, council of state, and an independent judiciary. The government is elected by universal suffrage; however, the legislature is not proportionate, with low-population districts receiving more representatives per person than those with high populations. There are ten administrative regions which are divided into 138 districts, each with its own district assembly. Below districts are various types of councils, including 58 town or area councils, 108 zonal councils, and 626 area councils. Sixteen thousand unit committees exist on the lowest level. The legal system is based on British common law, customary (traditional) law, and the 1992 constitution. Court hierarchy consists of Supreme Court of Ghana (highest court), courts of appeal, and high courts of justice. Beneath these bodies are circuit, magisterial, and traditional courts. Extrajudicial institutions include public tribunals. Since independence, courts are relatively independent; this independence continues under the Republic. Lower courts are being redefined and reorganized under the Republic. Political parties became legal in mid-1992 after a ten-year hiatus. There are many political parties under the Fourth Republic; the major ones are the National Democratic Congress which won presidential and parliamentary elections in 1992, 1996 and 2008; the New Patriotic Party, the major opposition party which won elections in 2000 and 2004; the People's National Convention, and the Convention People's Party, successor to Kwame Nkrumah's original party of the same name. Since independence, Ghana has been devoted to ideals of nonalignment and Pan-Africanism, both closely identified with Nkrumah. Ghana favours international and regional political and economic co-operation, and is an active member of the United Nations and the African Union. Many Ghanaian diplomats and politicians hold positions in international organisations. These include Ghanaian diplomat and former Secretary-General of the United Nations Kofi Annan, International Criminal Court Judge Akua Kuenyehia, former President Jerry Rawlings and former President John Agyekum Kuffour who have both been elected chairmen of the Economic Community of West African States. In September 2010, Ghana's President John Atta Mills visited China on an official visit. Mills and China's President Hu Jintao, marked the 50th anniversary of diplomatic ties between the two nations, at the Great Hall of the People on 20 September 2010. China reciprocated with a visit in November 2011, by the Vice Chairman of the Standing Committee of the National People's Congress of China, Zhou Tienong who visited Ghana and met with Ghana's Vice President John Dramani Mahama. After establishing supremacy in the Gold Coast, Britain created the Gold Coast Regiment as a component of the West African Frontier Force (WAFF), which kept peace throughout the territories of the Gold Coast, Nigeria, Sierra Leone, and Gambia. In 1928, the WAFF became the Royal West African Frontier Force (RWAFF). British officers and non-commissioned officers organized, trained, and equipped the Gold Coast Regiment. On 31 July 1914, four days before the British declaration of war on Germany, Accra mobilized its military forces. The Gold Coast Regiment included 38 British officers, 11 British warrant or non-commissioned officers, 1,584 Africans (including 124 carriers for guns and machine guns), and about 300 reservists. Additionally, the four Volunteer Corps (Gold Coast Volunteers, Gold Coast Railway Volunteers, Gold Coast Mines Volunteers, and Ashanti Mines Volunteers) fielded about 900 men. The forces participated in the campaigns in Togo, Cameroon, and East Africa. The Gold Coast also played a significant role in the Allied war effort during World War II. On 27 June 1942, the United States Army activated the Air Transport Command in Cairo under Brigadier General Shepler Ward Fitzgerald . Ten days later, Fitzgerald moved his headquarters to Accra and organized the Africa-Middle East Wing. In late 1942, the United States Army expanded its presence in Accra by activating the 12th Ferrying Group Headquarters, the 41st Ferrying Squadron, and the 42nd Ferrying Squadron. The 12th Ferrying Group, which was part of a transportation network reaching from the US, via Africa, to the China-Burma-India theatre of operations, ensured the movement of men and materiel through Senegal, Ghana, and Chad. Approximately 65,000 Ghanaian soldiers (Gold Coast Regiments) fought on the side of the Allies during the Second World War. In 1957, the Ghana Army consisted of its headquarters, support services, three battalions of infantry and a reconnaissance squadron with armoured cars. Total strength was approximately 5,700 men. 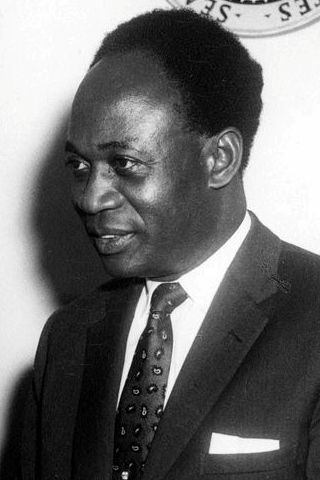 Ghanaian Prime Minister Kwame Nkrumah wished to rapidly expand and Africanise the army in order to support his Pan-African and anti-colonial ambitions. Thus in 1961, 4th and 5th Battalions were established, and in 1964 6th Battalion was established, from a parachute unit originally raised in 1963. Today, the Ghana Armed Forces are in military alliance with the People's Republic of China's People's Liberation Army. Ghana has in the past contributed forces to numerous UN and ECOWAS operations, including in the Democratic Republic of the Congo, Lebanon, and Liberia (ECOMOG and UNMIL). Ghana also contributed UN peacekeepers in UNAMIR during the Rwandan Genocide. In his book Shake Hands with the Devil, Canadian Forces commander Roméo Dallaire gave the Ghanaian soldiers high credit for their work and effort in the conflict. Ghana is a Middle Income Economy and is ranked as a Lower–Middle Income Economy by the World Bank. In 2011, 27% of Ghana's population were living on less than $1.25 per day (excluding Ghanaian citizens), and in 2011 there was a rate of 25% youth unemployment (excluding Ghanaian citizens). Ghana has more than twice the per capita output of the poorer countries in West Africa. Known for its gold in colonial times, Ghana remains one of the world's top gold producers and second largest producer of gold in Africa, behind South Africa. Gold is mined and produced in the southern regions. Other exports such as cocoa, crude oil, natural gas, timber, electricity, diamond, bauxite, and manganese which are all located in Southern regions, are major sources of foreign exchange, although Ghana is a developing nation after 55 years of independence. The Akosombo Dam, which was built on the Volta River in 1965 by Osagyefo Dr. Kwame Nkrumah provides hydro-electricity for Ghana and its neighbouring countries. The Ghana Stock Exchange (GSE) is the third largest stock exchange in Africa after the Johannesburg Stock Exchange (JSE) and the Nigerian Stock Exchange (NSE). At the end of December 2011, Ghana's total external debt escalated to an all-time high of $18 billion (GH¢ 23.4 billion) up from $8 billion (GH¢ 8.8 billion) at the end of December 2008. Ghana's debt totaled US$1 billion in 1966 by Nkrumah's government and Ghana was among the wealthiest and most socially advanced areas in Africa, which in the 1960s Ghana had a per capita income comparable to South Korea’s, then the debt significantly increased from US$1 billion to $7.5 billion during Rawlings' 20 years as head of Ghana, which ended in 2001. The escalation of borrowing from the International Monetary Fund (IMF) and creditors by successive governments have put a burden of debt on future generations of Ghanaians. Typical among these is the borrowing of $3 billion in December 2011 from China Development Bank in exchange of oil from Ghana National Petroleum Corporation (GNPC) to the China crude oil Off-Takers for an undisclosed fee to offset the loan, and was met with objections from an overwhelmingly majority of the Parliament of Ghana, as the loan would cause a net drain of Ghana's oil wealth to China and put Ghana at risk of default. Despite having an abundant amount of natural resources, Ghana receives foreign aid from the United States and European nations. Ghana’s labour force in 2008 totalled 11.5 million people. The domestic economy revolves around services, which accounts for 48.5% of GDP and employs 28% of the work force. Manufacturing accounts for 25.9% of GDP and provides employment for 20% of the work force. Agriculture accounts for 25.6% of GDP and provides employment for 52% of the work force, mainly small landholders. The value added tax is a consumption tax administered in Ghana. The tax regime which started in 1998 had a single rate but since September 2007 entered into a multiple rate regime. In 1998, the rate of tax was 10% and amended in 2000 to 12.5%. However with the passage of Act 734 of 2007, a 3% VAT Flat Rate Scheme (VFRS) began to operate for the retail distribution sector. This allows retailers of taxable goods under Act 546 to charge a marginal 3% on their sales and account on same to the VAT Service. It is aimed at simplifying the tax system and increasing compliance. Tourism is a rapidly growing sector particularly among Europeans, Americans, and other internationals connected to the Ghanaian Diaspora abroad. Ghana's political and economic stability, low crime rate, and wide use of English make the country an attractive entrypoint to West Africa for foreigners. UNESCO World Heritage Sites including Cape Coast Castle and Elmina Castle, national parks such as Kakum National Park and Mole National Park, as well as cultural celebrations such as Panafest are major centers of tourist activity. Commercial quantities of offshore oil reserves in Ghana were discovered in the 1970s. In 1983 the government established the Ghana National Petroleum Corporation (GNPC) to promote exploration and production, and the company reached agreements with a number of foreign firms. The most important of these permitted US-based Amoco to prospect in ten offshore blocks between Ada and the western border with Togo. Petro-Canada International had prospected in the Tano River Basin, and Diamond Shamrock in the Keta Basin. In 1989 three companies, two American and one Dutch, spent US$30 million drilling wells in the Tano basin. On 21 June 1992, an offshore Tano basin well produced about 6,900 barrels (1,100 m3) of crude oil daily. In the early 1990s, GNPC reviewed all earlier crude oil and natural gas discoveries to determine whether a predominantly local operation might make exploitation more commercially viable. GNPC wanted to set up a floating system for production, storage, off-loading, processing, and gas-turbine electricity generation, hoping to produce 22 billion cubic feet (620,000,000 m3) per day, from which 135 megawatts of power could be generated and fed into the national and regional grid. GNPC also signed a contract in 1992 with Angola's state oil company, Sonangol Group, that provides for drilling and, ultimately, production at two of Sonangol's offshore oilfields. GNPC was paid with a share of the crude oil. The country's Tema Oil Refinery underwent the first phase of a major rehabilitation in 1989. The second phase began in April 1990 at an estimated cost of US$36 million. Once rehabilitation was completed, distribution of liquified petroleum gas was to be improved, and the quantity supplied was to rise from 28,000 to 34,000 barrels per day. Construction on the new Tema-Akosombo oil products pipeline, designed to improve the distribution system further, began in January 1992. The pipeline was to carry refined products from Tema to Akosombo Port, where they will be transported across Lake Volta to northern regions. Distribution continued to be uneven, however. Other measures to improve the situation included a US$28 million project to set up a national network of storage depots in all regions. The Tema Lube Oil Company commissioned its new oil blending plant, designed to produce 25,000 tons of oil per year, in 1992. The plant was to satisfy all of Ghana's requirements for motor and gear lubricants and 60 percent of the country's need for industrial lubricants, or, in all, 90 percent of Ghana's demand for lubricant products. Shareholders included Mobil, Shell, and British Petroleum (together accounting for 48 percent of equity), Ghana National Petroleum Corporation, and the Social Security and National Insurance Trust (SSNIT). An oilfield which is reported to contain up to 3 billion barrels (480,000,000 m3) of light oil was discovered in 2007. Oil and gas exploration is ongoing, and the amount of both resources continues to increase. There is expected to be a tremendous inflow of capital into the economy beginning from the first quarter of 2011 when the country starts producing oil in commercial quantities. The oil is expected to account for 6% of the revenue for 2011. Ghana is believed to have up to 5 billion barrels (790,000,000 m3) of oil in reserves, which is the sixth largest in Africa and the 25th largest proven reserves in the world. The US Navy ship Fort McHenry being unloaded at Tema Port, November 2007. Tema Port, officially opened in 1962, is the biggest of the two seaports in Ghana, and is Africa's largest manmade harbour. It has a water-enclosed area of 1.7 square kilometres (0.66 sq mi) and a total land area of 3.9 square kilometres (1.5 sq mi). Apart from handling goods for Ghana, it is also a traffic junction, where goods are transhipped, and transit cargo destined for the landlocked countries of Burkina Faso, Mali and Niger. The port of Tema handles 80% of the nation’s import and export cargo. Most of the country’s chief export, cacao, is shipped from Tema. Container terminal at Tema Port, June 2008. The port has 5 kilometres (3.1 mi) of breakwaters, 12 deepwater berths, an outsize oil tanker berth, a dockyard, warehouses, and transit sheds. The port has open and covered areas for the storage of cargo, including a 77,200-m² (7.72-hectare) paved area for the storage of containers, steel products and other conventional cargo. The port's container yard is capable of holding over 8,000 TEUs at any given time. The closed storage area, which is about 25,049 m² (2.51 hectares) in area, consists of six sheds with a total storage capacity of 50,000 tonnes of cargo. The port also includes a 100,000 dwt dry dock and slipway facility. The Tema and Takoradi harbours are operated by the Ghana Ports and Harbours Authority. Ghana is a country located on the Gulf of Guinea, only a few degrees north of the Equator, therefore giving it a warm climate. The country spans an area of 238,500 km2 (92,085 sq mi). 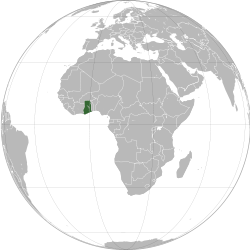 It is surrounded by Togo to the east, Côte d'Ivoire to the west, Burkina Faso to the north and the Gulf of Guinea (Atlantic Ocean) to the south. Ghana lies between latitudes 4° and 12°N, and longitudes 4°W and 2°E. The Prime Meridian passes through the country, specifically through the industrial city of Tema. Ghana is geographically closer to the "centre" of the world than any other country even though the notional centre (0°, 0°) is located in the Atlantic Ocean approximately 614 km (382 mi) south of Accra, Ghana, in the Gulf of Guinea. The country encompasses flat plains, low hills and a few rivers. Ghana can be divided into five different geographical regions. The coastline is mostly a low, sandy shore backed by plains and scrub and intersected by several rivers and streams while the northern part of the country features high plains. Southwest and south central Ghana is made up of a forested plateau region consisting of the Ashanti uplands and the Kwahu Plateau; the hilly Akuapim-Togo ranges are found along the country's eastern border. The Volta Basin also takes up most of central Ghana. Ghana's highest point is Mount Afadjato which is 885 m (2,904 ft) and is found in the Akwapim-Togo Ranges. The climate is tropical. The eastern coastal belt is warm and comparatively dry, the southwest corner is hot and humid, and the north is hot and dry. Lake Volta, the world's largest artificial lake, extends through large portions of eastern Ghana and many tributary rivers such as the Oti and Afram rivers flow into it. There are two main seasons in Ghana: the wet and the dry seasons. Northern Ghana experiences its rainy season from March to November while the south, including the capital Accra, experiences the season from April to mid-November. Southern Ghana contains evergreen and semi-deciduous forests consisting of trees such as mahogany, odum and ebony. It also contains much of Ghana's oil palms and mangroves. Shea trees, baobabs and acacias are usually found in the Volta region and the northern part of the country. Ghana has a reported population of about 24 million people. Ghana's first post-independence population census, in 1960, counted 6.7 million inhabitants. The native and largest ethnic group is Akan, who are located in Akanland. As of 2012, 11 million of the population are Akan. Ghana has not seen the kind of ethnic conflict that has created civil wars in many other African countries. The minority ethnic groups in Ghana are: Moré–Dagbani (Population: 2,406,940) in Upper west region - Upper East region and Northern region, Ewe (Population: 2,200,000) in Volta region, Ga-Adangbe (Population: 1,022,144) in Greater Accra, Gurma (Population: 702,000) in Upper East region, and Guang (Population: 354,567) in Northern region, others are Europeans (of mostly Scottish, English, and Scandinavian descent), Asians (of mostly Han Chinese and Sindhi-Indian descent), Syrian and Lebanese. The immigrant and illegal immigrant population of Ghana is predominantly made up of Nigerians and other nationals from West African countries. A view of the suburbs surrounding the central business district of Accra, the capital of Ghana, June 2008. As of 2009, life expectancy at birth is about 63 years for males and females with infant mortality at 40 per 1000 live births. The total fertility rate is 3.39 children per woman. There were about 15 physicians and 93 nurses per 100,000 persons in 2010. 4.5% of the country's GDP was spent on health in 2003. Attempts to improve the healthcare system in Ghana are believed to have been hampered by a high rate of corruption within the Ghana Ministry of Health, Ghana Health Service and National Health Insurance Scheme (NHIS). English is Ghana's official language and predominates in government and business affairs. It is also the standard language used for educational instruction. The largest native language spoken is Akan, which is spoken by 80% of Ghana's population. Languages of Ghana are divided into six families of the Niger–Congo languages. The Kwa family include, Akan spoken in Akanland and is spoken by 80% of the country's population. Ga–Dangme is spoken in Greater Accra. The Gbe languages, once included in Kwa, are represented by Ewe, spoken in the Volta region. The Gur family includes Dagomba, Dagaare, and Kasem, and are found predominantly in Upper West region, Upper East region, and Northern region of Ghana. Nine languages have the status of government-sponsored languages: Akan spoken in Akanland, Ga and Dangme spoken in Greater Accra, Dagomba and Gonja spoken in Northern region, Ewe spoken in Volta region, Dagaare spoken in Upper West region, Kasem spoken in Upper East region, and Nzema. Since 2007, all university and college institutions in Ghana provided Chinese language courses. This initiative reflected the People's Republic of China's growing role as a superpower and Ghana's close ties with China. In addition, as an OIF associated-member, French is increasingly taught in Ghana's high schools. In 2000, Christianity was Ghana's largest religion, and predominated in southern areas and parts of upper west, upper east and northern region, with Islam being more widespread in parts of upper west, upper east and the northern region. Christian–Muslim and faith relations in Ghana are peaceful, tolerant and bilateral, without the sectarian violence of neighboring countries with similar regional divides such as Côte d'Ivoire. A declining percentage of the population practice traditional African religions. In 2000, Christianity was practiced by some 68.8 percent of the population, according to the 2000 census. Christianity was introduced by Europeans on the coast of Ghana in the fourteenth century, and spread with them. Dominant Christian denominations are Catholicism, Methodism, and Presbyterianism. In 2000, Islam was the faith of 15.9% of the population. It was introduced to northern Ghana by the Soninke and Dyula in the 15th century. In 2000, Traditional religion was practiced by 8.5%. In 2000, Atheism was the faith of 6.1% of the population. Hinduism in Ghana, is administered by Ghana's Hindu Monastery headed by Swami Ghananand Saraswati. As of 2009 there were about 10,000 African Hindus in Ghana. The other faiths in Ghana are Buddhism, Judaism and Animism. Ghana is an ethnically diverse country that is predominantly influenced by the ancient Kingdoms of the Akan. Ghanaian culture is a mixture of the cultures of its peoples, predominantly Akan, Ewe, Ga-Adangbe, and Moré-Dagbani, with the Akan being dominant. Ghana's cultural diversity is most evident in cuisine, arts, and clothing. Football is the most popular sport. The national men's football team is known as the Black Stars, with the under-20 team known as the Black Satellites. Ghana has participated in many championships, including the African Cup of Nations, the FIFA World Cup and the FIFA U-20 World Cup. In the 2010 FIFA World Cup, Ghana became the third African country to reach the quarter-final stage of the World Cup after Cameroon in 1990 and Senegal in 2002. There are several club football teams in Ghana, which play in the Ghana Premier League and Division One League, both managed by the Ghana Football Association. The country has also produced quite a few quality boxers such as Azumah Nelson a three-time world champion, Nana Yaw Konadu also a three-time world champion, Ike Quartey, and Joshua Clottey. Textiles are very important in Ghanaian culture. These cloths are used to make traditional and modern attire. Different symbols and different colours mean different things. Kente is probably the most famous of all the Ghanaian cloths. Kente is an Akan ceremonial cloth hand-woven on a horizontal treadle loom. Strips measuring about 4 inches wide are sewn together into larger pieces of cloths. Cloths come in various colours, sizes and designs and are worn during very important social and religious occasions. In a cultural context, kente is more important than just a cloth. It is a visual representation of history and also a form of written language through weaving. The term kente has its roots in the Twi word kɛntɛn which means a basket. The first kente weavers used raffia fibres to weave cloths that looked like kenten (a basket); and thus were referred to as kenten ntoma; meaning basket cloth. The original Asante name of the cloth was nsaduaso or nwontoma, meaning "a cloth hand-woven on a loom"; however, "kente" is the most frequently used term today. Variations of narrow-strip cloths similar to kente are also woven by the ethnic group Ga. It is also popular among the African diaspora. Ghana has been recognized on the international level through several artists, including the Kane Kwei Carpentry Workshop and Eric Adjetey Anang who are creating the famous design coffins. The music of Ghana is diverse and varies between different ethnic groups and regions. Ghanaian music incorporates several distinct types of musical instruments such as the talking drum ensembles, goje fiddle and koloko lute, court music, including the Akan atumpan, the Ga kpanlogo styles, and log xylophones used in asonko music. The most well known genres to have come from Ghana are Afro-jazz which was created by Ghanaian artist Kofi Ghanaba. and its earliest form of secular music is called highlife. Highlife originated in the late 19th century and early 20th century and spread throughout West Africa. In the 1990s a new genre of music was created by the youth incorporating the influences of Highlife Afro-reggae, dancehall and hiphop. This hybrid was called Hiplife. Ghanaian artists such as R&B and soul singer Rhian Benson and highlife singer Kojo Antwi have had international success. Ghana Cultural Dance Group performing. Ghanaian dance is as diverse as its music. Each ethnic group has their own traditional dances and there are different dances for different occasions. There are dances for funerals, celebrations, storytelling, praise and worship etc. Some of these dances include Adowa, Kpanlogo, Azonto, Klama, and Bamaya. Parallel with Ghana's administration, a few areas in Ghana maintain various structures of traditional rulership, protected by the constitution, such as Akanland. Officially the role of traditional leaders, such as Okyenhene, Asantehene, Ga Mantse, Yagbongwura and Akwamuhene, is cultural to mobilize the people at the local and community levels for development. These areas include Ashanti and Akwamu in Akanland. The media of Ghana is one of the freest in Africa. Chapter 12 of the 1992 Constitution of Ghana guarantees freedom of the press and independence of the media, while Chapter 2 prohibits censorship. Post independence, the government and media often had a tense relationship, with private outlets closed during the military coups and strict media laws that prevent criticism of government. The media freedoms were restored in 1992, and after the election in 2000 of John Agyekum Kufuor the tensions between the private media and government decreased. Kufuor was a supporter of press freedom and repealed a libel law, though maintained that the media had to act responsibly. The Ghanaian media has been described as "one of the most unfettered" in Africa, operating with little restriction on private media. The private press often carries criticism of government policy. The media were vigorous in their coverage of the 2008 Ghanaian presidential election, and the Ghanaian Journalists Association (GJA) praised John Atta Mills on his election, hoping to foster a good media-government relationship. The adult literacy rate in Ghana was 75% in 2007, with males at 87.2% and females at 67.1%. Ghana has a six-year primary education system beginning at age six, and, under the educational reforms implemented in 1987 and reformed in 2007, they pass on to a three-year junior high school system. At the end of the third year of junior high, there is a mandatory "Basic Education Certificate Examination". Those continuing must complete the four-year senior high school program (which has been changed to three years) and take an admission exam to enter any university or tertiary programme. Presently, Ghana has 21,530 primary schools, 8,850 junior secondary schools, 900 senior secondary schools, 52 public training colleges, 5 private training colleges, 5 polytechnical institutions, 4 non-university public tertiary institutions, 8 public universities and over 45 private tertiary institutions. Most Ghanaians have relatively easy access to primary and secondary education. These numbers can be contrasted with the single university and handful of secondary and primary schools that existed at the time of independence in 1957. Ghana's spending on education has varied between 28–40% of its annual budget in the past decade. All teaching is done in English, mostly by qualified Ghanaian educators. The courses taught at the primary or basic school level include English, Ghanaian language and culture, mathematics, environmental studies, social studies and French as a third language are added, integrated or general science, pre-vocational skills and pre-technical skills, religious and moral education, and physical activities such as music, dance and physical education. The senior high level school curriculum has core subjects and elective subjects of which students must take four the core subjects of English language, mathematics, integrated science (including science, agriculture and environmental studies) and social studies (economics, geography, history and government). The high-school students also choose three elective subjects from five available programmes: agriculture programme, general programme (arts or science option), business programme, vocational programme and technical programme. Apart from most primary and secondary schools which choose the Ghanaian system of schooling, there are also international schools such as the Ghana International School, Takoradi International School, Tema International School, Galaxy International School, The Roman Ridge School, Lincoln Community School, Faith Montessori School, American International School, SOS Hermann Gmeiner International College and International Community School, which offer the International Baccalaureat, Advanced Level General Certificate of Education and the International General Certificate of Secondary Education (IGCSE). With over 95% of its children in school, Ghana currently has one of the highest school enrollment rates in all of Africa. The ratio of girls to boys in the total education system is 1:0.96, which for a West African country is a considerable achievement. That said, some 470,000 children still remain out of school because of corruption, which has led to resource constraints in building schools, providing adequate textbooks and training new teachers. There are six national public universities in Ghana, the University of Ghana, Kwame Nkrumah University of Science and Technology, University of Cape Coast, University of Education, University for Development Studies and University of Mines and Technology. Ghana also has a growing number of accredited private universities including Ashesi University College, Central University College, Catholic University College, Regent University College of Science and Technology and Valley View University. The oldest university in Ghana, The University of Ghana, was founded in 1948. It had a total of about 29,754 students in 2008. Its programmes in the Arts, Humanities, Business, and the Social Sciences, as well as Medicine are the best in the country. The University has produced the bulk of lawyers and politicians in the country. Unfortunately, the university's stiff opposition to the standard of a new senior secondary school system have seen a shift of its traditionally best students to the Kwame Nkrumah University. Since Ghana's independence, the country has been one of the most educational in sub-Saharan Africa. Former UN Secretary General Kofi Annan has been chancellor of the University of Ghana since 2008. Kwame Nkrumah University of Science and Technology, the second university to be established in Ghana, is the premier university of science and technology in Ghana and West Africa. ^ "Emefa.myserver.org". http://www.emefa.myserver.org/Ghana.mp3. Retrieved 21 December 2010. ^ a b "Ghana -Language and Religion". ghanaembassy.org. Embassy of Ghana in Washington, D.C.. http://www.ghanaembassy.org/index.php?page=language-and-religion. Retrieved 9 April 2012. ^ (2010) "2010 Provisional Census Results Out". Retrieved on 7 February 2011. ^ a b c d "Ghana". International Monetary Fund. http://www.imf.org/external/pubs/ft/weo/2012/01/weodata/weorept.aspx?pr.x=67&pr.y=13&sy=2009&ey=2012&scsm=1&ssd=1&sort=country&ds=.&br=1&c=652&s=NGDPD%2CNGDPDPC%2CPPPGDP%2CPPPPC%2CLP&grp=0&a=. Retrieved 2012-April-18. ^ Jackson, John G. Introduction to African Civilizations, 2001. Page 201. ^ "First For Sub-Saharan Africa". BBC. http://www.bbc.co.uk/worldservice/africa/features/storyofafrica/14chapter3.shtml. Retrieved 29 February 2012. ^ "Exploring Africa - Decolinization". exploringafrica.matrix.msu.edu. http://exploringafrica.matrix.msu.edu/images/decolinization.jpg. Retrieved 29 February 2012. ^ "World Cocoa - WorldCrops.com". worldcrops.com. http://www.worldcrops.com/wp-content/uploads/2010/11/WORLD-COCOA-May-03-2011-WorldCrops.com_.pdf. Retrieved 29 February 2012. ^ "Geography.about.com". Geography.about.com. http://geography.about.com/library/cia/blcghana.htm. Retrieved 26 June 2010. ^ "Etymology of Ghana". Douglas Harper. http://www.etymonline.com/index.php?term=Ghana. Retrieved 12 May 2012. ^ "Ghana Museums & Monuments Board". ghanamuseums.org. http://www.ghanamuseums.org/archaeo-sites-others.php. Retrieved 15 February 2012. ^ of the Tribes and States 23.books.google.com. Retrieved 13 December 2010. ^ a b Pre-Colonial Period. ghanaweb.com. Retrieved 13 December 2010. ^ Fishing for Development – Akan Bono 11th century.books.google.com. Retrieved 13 December 2010. ^ "West Africa and the British". Sanderson Beck. http://www.san.beck.org/16-10-WestAfricaBritish.html. Retrieved 20 May 2012. ^ "History of Ghana". TonyX. http://www.tonyxworld.com/index.php?option=com_content&task=view&id=2&Itemid=38. Retrieved 20 May 2012. ^ Levy, Patricia; Wong, Winnie (2010). Ghana. Marshall Cavendish. p. 24. ISBN 978-0-7614-4847-1. ^ a b c "History of Ghana". ghanaweb.com. http://www.ghanaweb.com/GhanaHomePage/history/. Retrieved 10 January 2011. ^ Bush Praises Strong Leadership of Ghanaian President Kufuor. America.gov. 15 September 2008. ^ Nana Prempeh I (1870–1931). blackhistorypages.net. Retrieved 13 January 2012. ^ Why Science Matters – Ashanti defeated British.books.google.com. Retrieved 13 December 2010. ^ Sankofa: a journal of African children's and young adult literature, Volumes 1–5. ^ Webcitation.org, Archived 31 October 2009. ^ The history of Ghana – Google Books. Books.google.com. 2005. ISBN 978-0-313-31894-8. http://books.google.com/?id=T9io2oPOAXAC&pg=PA92&lpg=PA92&dq=ugcc+ghana+self+governance. Retrieved 26 June 2010. ^ "Ghana Flag". Ghanaweb.com. http://www.ghanaweb.com/GhanaHomePage/republic/flag.php. Retrieved 26 June 2010. ^ Adam Curtis (22 June 1992). "Interview with John Stockwell on 'Black Power'". BBC Two series, "Pandora's Box":. ^ "Ghana – MSN Encarta". Ghana – MSN Encarta. http://encarta.msn.com/encyclopedia_761570799_10/Ghana.html. ^ "BBC: Opposition leader wins Ghana poll – modernghana.com/ghana elections". Modernghana.com. http://www.modernghana.com/news/197296/1/bbc-opposition-leader-wins-ghana-poll.html. Retrieved 26 June 2010. ^ "Thousands celebrate as new president takes office". The Guardian (London). 8 January 2009. http://www.guardian.co.uk/world/2009/jan/08/world-news-in-brief. ^ "Ghana's President John Atta Mills dies". BBC News. http://www.bbc.co.uk/news/world-africa-18972107. Retrieved 2012-July-26. ^ "John Atta Mills, President of Ghana, Dies at 68". The New York Times. http://www.nytimes.com/2012/07/25/world/africa/john-atta-mills-ghanas-president-dies-68.html. Retrieved 2012-July-26. ^ "Foreignpolicy.com" (PDF). http://www.foreignpolicy.com/images/090624_2009_final_data.pdf. Retrieved 26 June 2010. ^ "Welcome to the Mo Ibrahim Foundation". Moibrahimfoundation.org. http://www.moibrahimfoundation.org/. Retrieved 26 June 2010. ^ "Corruption Perceptions Index 2011". cpi.transparency.org. Transparency International Corruption Perception Index. http://cpi.transparency.org/cpi2011/results/. Retrieved 7 January 2012. ^ a b c d e f "Government and Politics". A Country Study: Ghana (La Verle Berry, editor). Library of Congress Federal Research Division (November 1994). This article incorporates text from this source, which is in the public domain. Lcweb2.loc.gov. ^ Idun-Arkhurst, Isaac (2008). Ghana's Relations with China. Johannesburg: South African Institute of International Affairs. ISBN 1-919969-32-2. ^ "Official page of Nations Permanent Mission of Ghana to the United Nations". Author: un.int. United Nations. 20 September 2011. http://www.un.int/ghana/. Retrieved 20 May 2012. ^ "Hu Jintao Holds Talks with President of Ghana Mills". Author: fmprc.gov.cn. Ministry of Foreign Affairs of the People's Republic of China. 20 September 2010. http://www.fmprc.gov.cn/eng/wjb/zzjg/fzs/gjlb/2999/3001/t755583.htm. Retrieved 4 January 2012. ^ Deng, Shasha (12 November 2011). "Visiting senior Chinese official lauds Ghana for political stability, national unity". Xinhua. http://news.xinhuanet.com/english2010/china/2011-11/12/c_122269189.htm. Retrieved 13 November 2011. ^ a b Christopher R. Kilford, The Other Cold War: Canada's Military Assistance to the Developing World 1945–75, Kingston, Ontario: Canadian Defence Academy Press, 2010, p. 138. ^ Simon Baynham, The Military and Politics in Nkumrah's Ghana, Westview, 1988, Chapter 4. ^ "China-Ghana strengthen military ties". Author: People's Daily Online. People's Daily. 24 November 2011. http://english.people.com.cn/90786/7655236.html. Retrieved 3 January 2012. ^ a b c "Ghana: World Bank Country Data". worldbank.org. World Bank. http://data.worldbank.org/country/ghana. Retrieved 1 April 2012. ^ "As Ghana Grows, Demand for Water Follows". worldbank.org. World Bank. 3 January 2011. http://web.worldbank.org/WBSITE/EXTERNAL/NEWS/0,,contentMDK:22800031~pagePK:64257043~piPK:437376~theSitePK:4607,00.html. Retrieved 1 April 2012. ^ Charles Kenny & Andy Sumner (12 July 2011). "How 28 poor countries escaped the poverty trap". The Guardian. http://www.guardian.co.uk/global-development/poverty-matters/2011/jul/12/world-bank-reclassifies-28-poor-countries. Retrieved 1 April 2012. ^ Vincent Tay & Frank Odhiambo. "The Poverty Millennium Development Goal - What water, sanitation and hygiene can do in Ghana". lboro.ac.uk. Loughborough University. http://www.lboro.ac.uk/well/resources/Publications/Country%20Notes/CN1.1%20Ghana.htm. Retrieved 1 April 2012. ^ "High Food Prices and Popular Uprisings – Is Ghana at Risk?". Ghanaweb.com. http://www.ghanaweb.com/GhanaHomePage/NewsArchive/artikel.php?ID=204866. Retrieved 19 February 2012. ^ "Ghama Market Introduction". britishcouncil.org. British Council. http://www.britishcouncil.org/eumd-information-background-ghana.htm. Retrieved 8 March 2012. ^ a b Dave Brown. "Top 10 Gold Producers". Gold Investing News. http://goldinvestingnews.com/9230/top-10-gold-producers.html. Retrieved 8 March 2012. ^ "Aluworks.com". Aluworks.com. http://www.aluworks.com/site/index.php?option=com_content&view=article&id=63&Itemid=60&734e1554a786d82e908c7c85044123c2=746b376516a36724613692ecab763f6f. Retrieved 26 June 2010. ^ "The Electricity and Gas Shortages in Ghana – a terrible situation". modernghana.com. 25 May 2011. http://www.modernghana.com/news/330509/1/the-electricity-and-gas-shortages-in-ghana-a-terri.html. Retrieved 7 January 2011. ^ a b "Mills takes Ghana's debt to GH¢23.4 billion". thestatesmanonline.com. 9 January 2012. http://www.thestatesmanonline.com/pages/news_detail.php?newsid=10897&section=1. Retrieved 9 January 2012. ^ "Ghana will be shortchanged with the 3-billion dollars Chinese loan – Minority". ghananewsagency.org. 27 September 2011. http://www.ghananewsagency.org/details/Economics/Ghana-will-be-shortchanged-with-the-3-billion-dollars-Chinese-loan-Minority/?ci=3&ai=34013. Retrieved 9 January 2012. ^ "EU gives Ghana additional 52 million euros for maternal health". ghanaweb.com. 11 January 2012. http://www.ghanaweb.com/GhanaHomePage/health/artikel.php?ID=227452. Retrieved 13 January 2012. ^ a b c Annex 1: Political and Administrative System. worldbank.org. Retrieved 29 December 2011. ^ a b "Ghana – Gross Domestic Product". statsghana.gov.gh. http://www.statsghana.gov.gh/docfiles/GDP/revised_gdp_2011_april-2012.pdf. Retrieved 13 June 2012. ^ "Income Taxes". ghanaweb.com. http://www.ghanaweb.com/GhanaHomePage/economy/tax.php. Retrieved 10 January 2011. ^ "Trade Expo International Ghana". uniquetrustex.com. http://www.uniquetrustex.com/node/162/177/?ex=trade-expo-international-ghana&nid=162. Retrieved 20 May 2012. ^ a b c d Clark, Nancy L. "Petroleum Exploration". A Country Study: Ghana (La Verle Berry, editor). Library of Congress Federal Research Division (November 1994). This article incorporates text from this source, which is in the public domain. Lcweb2.loc.gov. ^ "Ghana leader: Oil reserves at 3B barrels – Yahoo! News". Web.archive.org. 22 December 2007. Archived from the original on 26 December 2007. http://web.archive.org/web/20071226200944/http://news.yahoo.com/s/ap/20071222/ap_on_re_af/ghana_oil_discovery_3. Retrieved 21 December 2010. ^ "Kosmos Makes Second Oil Discovery Offshore Ghana". Rigzone.com. 25 February 2008. http://www.rigzone.com/news/article.asp?a_id=57319. Retrieved 26 June 2010. ^ McLure, Jason. Ghana Oil Reserves to Be 5 billion barrels (790,000,000 m3) in 5 years as fields develop. Bloomberg Television. Wednesday, 1 December 2010. ^ "President Storms Tema Harbour Over Anas Video... We Promise Not To Take Bribes Again, We Have Repented". modernghana.com. http://www.modernghana.com/news/315349/1/president-storms-tema-harbour-over-anas-video-we-p.html. Retrieved 19 February 2012. ^ Ghana Ports and Harbours Authority.ghanaports.gov.gh. Retrieved 1 January 2012. ^ a b "CIA – The World Factbook – Ghana". U.S. CIA. https://www.cia.gov/library/publications/the-world-factbook/geos/gh.html. Retrieved 5 December 2009. ^ a b Including the Moré(Population: 341,000) "World Map - People Group Name: Mossi". worldmap.org. http://worldmap.org/getpeople.php?ROP_ROG3=106781GH. Retrieved 7 April 2012. , Dagomba, Dagaaba (Population: 657,973) "World Map - People Group Name: Dagaari (Dagaaba)". worldmap.org. http://worldmap.org/getpeople.php?ROP_ROG3=102365GH. Retrieved 8 April 2012. , Mamprusi, Gurunsi (Population: 154,000) "World Map - People Group Name: Gurunsi". worldmap.org. http://worldmap.org/getpeople.php?ROP_ROG3=105697GH. Retrieved 7 April 2012. and Frafra(Population: 635,866) "World Map - People Group Name: Gurenne (Frafra)". worldmap.org. http://worldmap.org/getpeople.php?ROP_ROG3=111200GH. Retrieved 8 April 2012. ^ "Jamaica National launches new Ghana money transfer brand". jamaicaobserver.com. 16 September 2011. http://www.jamaicaobserver.com/business/Jamaica-National-launches-new-Ghana-money-transfer-brand_9719123. Retrieved 20 February 2012. ^ "Ghana – MSN Encarta". Ghana – MSN Encarta. http://encarta.msn.com/encyclopedia_761570799_2/Ghana.html. ^ "World Map - People Group Name: Ewe". worldmap.org. http://worldmap.org/getpeople.php?ROP_ROG3=102974GH. Retrieved 7 April 2012. ^ "World Map - People Group Name: Ga". worldmap.org. http://worldmap.org/getpeople.php?ROP_ROG3=104520GH. Retrieved 8 April 2012. ^ "World Map - People Group Name: Adangme". worldmap.org. http://worldmap.org/getpeople.php?ROP_ROG3=100052GH. Retrieved 8 April 2012. ^ "World Map - People Group Name: Gurma". worldmap.org. http://worldmap.org/getpeople.php?ROP_ROG3=103587GH. Retrieved 7 April 2012. ^ "World Map - People Group Name: Guang". worldmap.org. http://worldmap.org/getpeople.php?ROP_ROG3=103437GH. Retrieved 7 April 2012. ^ a b "CIA – The World Factbook". Cia.gov. https://www.cia.gov/library/publications/the-world-factbook/geos/gh.html. Retrieved 21 December 2010. ^ a b "Afro.who.int". Afro.who.int. http://www.afro.who.int/home/countries/fact_sheets/ghana.pdf. Retrieved 26 June 2010. ^ "Corruption In NHIS". modernghana.com. 14 October 2011. http://www.modernghana.com/news/355988/1/corruption-in-nhis.html. Retrieved 7 January 2011. ^ "Teach Chinese language in schools – Minister". modernghana.com. 4 May 2007. http://www.modernghana.com/news/135274/1/teach-chinese-language-in-schools-minister.html. Retrieved 12 January 2011. ^ "Le français, enjeu du XXI Sisécle (french)". francophonie.org. http://www.francophonie.org/IMG/pdf/Fcs_enjeu_21esiecle.pdf. Retrieved 17 December 2010. ^ "International Religious Freedom Report 2007". U.S. Department of State. http://www.state.gov/g/drl/rls/irf/2007/90100.htm. Retrieved 5 December 2009. ^ "State Building in Cote d’Ivoire and Ghana". humansecuritygateway.com. Human Security Gateway. http://www.humansecuritygateway.com/documents/ISA_identitypolarizationconflict.pdf. Retrieved 16 January 2012. ^ a b c d e Ghana – International Religious Freedom Report 2009. state.gov. 26 October 2009. Retrieved 11 January 2010. ^ Ghana Religion – OverLandingAfrica. overlandingafrica.com. Retrieved 24 February 2010. ^ Trisha Gupta (15 August 2009). "Culture & Society - The Swami Of Accra". tehelka.com. Tehelka. http://www.tehelka.com/story_main42.asp?filename=hub150809the_swami.asp. Retrieved 13 June 2012. ^ Rajesh Joshi (29 June 2010). "Ghana's unique African-Hindu temple". bbc.co.uk. BBC News. http://www.bbc.co.uk/news/10401741. Retrieved 13 June 2012. ^ a b "Ms.Ghana Culture". misswestafricaghana.com. http://www.misswestafricaghana.com/culture/. Retrieved 20 May 2012. ^ "USA 1–2 Ghana (aet)". NEWS.BBC.co.uk. 26 June 2009. http://news.bbc.co.uk/sport1/hi/football/world_cup_2010/matches/match_50. Retrieved 26 June 2010. ^ "Ghana: Kofi Ghanaba – Influential Drummer Who Emphasised the African Origins of Jazz". Ghanaian Chronicle. 12 February 2009. http://allafrica.com/stories/200902120888.html. Retrieved 30 May 2009. ^ Constitution of the Republic of Ghana; CHAPTER TWENTY-TWO; CHIEFTAINCY. Retrieved 2012-11-12. ^ Government of Ghana - Official portal. Retrieved 2012-11-05. ^ Chieftaincy, Traditional Governance and Leadership Project. Retrieved 2012-11-12. ^ Constitution of Ghana, Government of Ghana. ^ Anokwa, K. (1997). In Press Freedom and Communication in Africa. Erbio, F. & Jong-Ebot, W. (Eds. ), Africa World Press. ISBN 978-0-86543-551-3. ^ Ghanian Media, Press Reference. ^ GJA congratulates President Atta Mills, Joy Radio, 11 January 2009. ^ Country module Ghana. nuffic.nl. What to know about the National Accreditation Board (NAB). NAB.gov.gh. Retrieved 27 April 2010. ^ "TobeWorldwide.org". http://www.tobeworldwide.org/index.php?option=com_docman&task=doc_view&gid=4. Retrieved 26 June 2010. ^ "UNICEF - Basic Education and Gender Equality". unicef.org. United Nations Children's Fund (UNICEF). http://www.unicef.org/wcaro/wcaro_GHA_MTSP2.pdf. Retrieved 1 April 2012. ^ "This page is available to GlobePlus subscribers". Toronto: Theglobeandmail.com. http://www.theglobeandmail.com/news/world/a-fragile-island-of-stabilityin-a-sea-of-turbulence/article1214628/. Retrieved 26 June 2010. ^ "Ghana News :: '''Obama:''' What is the agenda for education in Ghana? ::: Breaking News | News in Ghana | features". News.myjoyonline.com. 10 July 2009. http://news.myjoyonline.com/features/200907/32516.asp. Retrieved 26 June 2010. ^ "About 470,000 Ghanaian children still out of school – UNICEF". ghanabusinessnews.com. 29 March 2012. http://www.ghanabusinessnews.com/2012/03/29/about-470000-ghanaian-children-still-out-of-school-unicef/. Retrieved 1 April 2012. ^ "University of Ghana". Ug.edu.gh. http://www.ug.edu.gh/index1.php?linkid=243&sublinkid=72. Retrieved 26 June 2010. This page uses content from the English language Wikipedia. The original content was at Ghana. The list of authors can be seen in the page history. As with this Familypedia wiki, the content of Wikipedia is available under the Creative Commons License.